There’s a brisk business in the sci-fi fiction world wherein writers devise plots regarding worlds thousands of millions of light years yonder, only reachable by wormholes or imagination. At the same time, astronomers here on earth keep their eyes stuck to their favorite observing instrument of choice seeking out new planets, and, because there appears to be an obvious lack of wormholes (or so I believe; I could be wrong), they use their imaginations to conceive images of what these new worlds would look like. On Independence Day, I sat on the porch of my parents’ house (so hard still to visit and not see my mother there) and flipped through the offerings on Endgadget. A posted article entitled, “The first potentially habitable alien planets we ever found – might not actually exist,” written by Richard Lawler caught my attention. In it, he writes about Gliese 581g, a planet orbiting Gliese 581, a star located in the constellation Libra. What made Gliese 581g so intriguing is its location in the “Goldilocks zone,” so called because it’s the correct distance from its sun to possess a moderate temperature for liquid water – not too hot or cold. It had also been determined that the planet didn’t spin on its axis and one side was perpetually in the dark. Artists created imaginative drawings, dreaming up visions of what this planet could look like. Alas, it appears to have been all for naught. 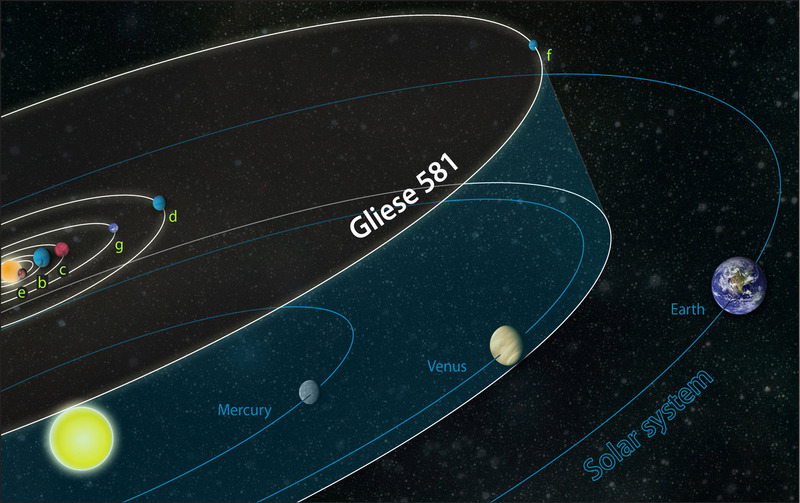 Spectrographic readings taken from Gliese 581 now indicate that 581g might actually not exist. How is that possible? The short answer is that the very signals that determined a planet might be located in a particular place also can be attributed to another source, say, “space stuff.” What would have produced a signal for the spectrometer to read no longer exists. It faded. Disappeared. Or, alternatively, may have been misread. What a delicious idea for a plot. Take it from the 581g’s point of view. Of course, that wouldn’t be the name of the planet. In my head, it’d be more like Ulele or Onodon – a whispery moniker reminiscent of mystery and exotica. For millennia the habitants, fiercely protective of their unique home, shrouded their visibility because of a unique feature Ulele/Onodon hosts. A signal accidentally launched by a careless Uleleian/Onodonite as it lit its cigarette on a rations replenish break, triggers a spectrograph that sits in the Earth lab of Dr. Jill Jackson, a red-headed ball of fire pouncing on a grand opportunity to stake her position as the sharpest astrophysicist in the universe. Having maxed out her credit cards and on the brink of credit collapse, she aims for the Nobel Prize and its generous financial reward and reveals her discovery to fellow scientists. Unbeknownst to her, the Ulele/Onodons are hot on her trail, thanks to sensitive instruments tuned to the merest hint of detective devices such as the one Dr. Jackson uses, and seek revenge…but not before re-cloaking their planet. Vowing to hunt her down like an unwanted cockroach in a Harlem apartment, Ulele/Onodon Fowler Falx is hot on her trail, and won’t stop until she’s obliterated and vanishes from view…just like 581g. See, that explanation is much more entertaining than, “We thought we saw something…honest!…but it just…disappeared. Or, a similar incident as detailed above really happened and no one will admit it, because as any watcher of any sci-fi series involving space generally hide evidence regarding alien encounters. Since the jury is out on aliens’ actual existence, I’d like to seize this celestial development and give it a life, thicken its plot and give it hope for the future. Keep your eyes to the skies, folks. The universe is filled with enigmas. Hah! Love hearing the astrophysicist described as a “red-headed ball of fire”. Sounds like a decent start of a story. Well, aren’t stars balls of fire? In this case, Gliese is a red star…red head…fire…Lots to work with here!